TEACUP TURBULENCE, the fifth book to describe my solving a murder, is now available. It was published this month. Of course I have misgivings about those books. It's much more important to me to tell people about saving animals than it is to let them know about my unintended sideline of figuring out who killed someone. But I've been thinking a lot about what happened in TEACUP TURBULENCE. And how I happened to get involve and solve the mystery. In it, I took a plane ride. A couple, actually. Now, I'm not one to go on a lot of trips, even during vacations. In fact, I seldom take vacations, except, sometimes, to visit my kids at their respective colleges. My son Kevin attends Claremont-McKenna College, which is driving distance from our home, but my daughter Tracy goes to Stanford, which requires a plane ride and commitment of more than a day. Otherwise, I spend all my time at HotRescues, the wonderful no-kill pet shelter where I'm the chief administrator, helping to save animals' lives. But I can't imagine anything more worthwhile than to take a trip, by air or a roadtrip or both, where the goal is also to save the lives of animals needing homes. Not only that, but it's not fiction, like people--wrongly, of course--tend to consider my stories. There are actually a lot of dedicated pet rescuers who go to areas where there is a glut of animals needing new homes and relocate them to places where here are people who'll adopt them in a minute. As I described previously here at Killer Characters, TEACUP TURBULENCE is about rescuing--what else?--teacup-size dogs. There aren't enough adopters of those kinds of dogs in an area where a major puppy mill rescue was performed. But in L.A., even though we usually have too many little dogs, there was an ad campaign sponsored by my shelter's benefactor Dante DeFrancisco which led the demand for tiny dogs to new heights. That's why some wonderful volunteers flew a whole lot of the little rescues to L.A... and unfortunately that wound up leading to a murder. That part was a shame, of course. But the good thing was that the little dogs all got new homes. So if you'd like to learn more about this amazing and wonderful kind of rescue, read TEACUP TURBULENCE. Oh, and you can find out in it, too, how I just happened to solve another murder. 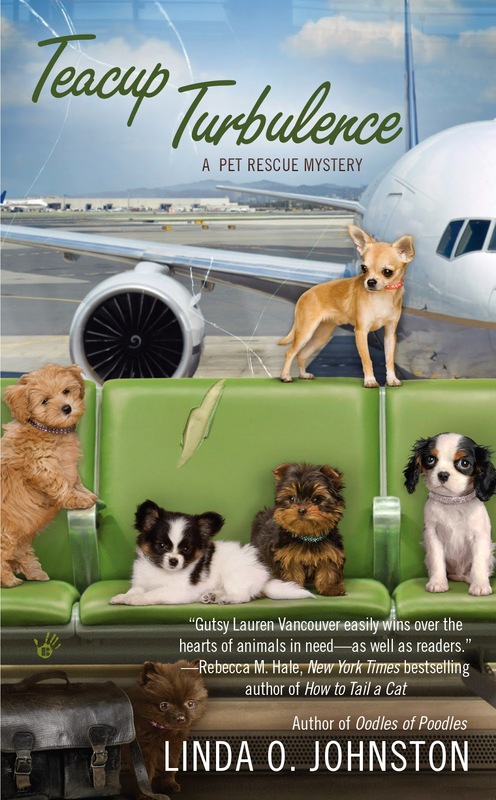 TEACUP TURBULENCE, the fifth Pet Rescue Mystery by Linda O. Johnston, is a January 2014 release from Berkley Prime Crime. As the human companion to a rescued kitten (she walked into my husband's work and he brought her home) I admire people who take the time to rescue animals and find them homes. I have two rescue dogs and two cats-who-chose-to-live-with-me, so that's enough animals for now, but I hate that so many need rescuing! Hugs to you, your husband, and especially your rescue kitten, Dianne B! I can't agree more, Willow. I just wish that more humans would act responsibly regarding pets.